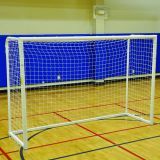 GM 8'x24' Goal is regulation, full-sized goal for advanced player training and competition. 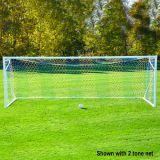 Looks and simulators performance of regulation goal, yet easily transportable. Safe in event of goal tipping. 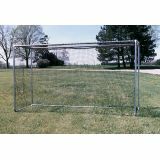 Powder coated, portable goal offers an extruded aluminum frame featuring our exclusive flush mount Easy Track™ net attachment system. Official size 6' 7" H (2m) x 9' 10" W (3m) meets specifications. Includes non-marring floor protectors, 4" sq. mesh net and Easy Clips™. For shared football and soccer fields. Meets high school regulations for competition football and soccer. 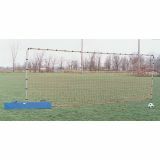 Soccer goal dimensions are 8' x 24', and football crossbar is 10' high. Football uprights can be installed at high school (23' 4") or collegiate (18' 6") widths, or removed for soccer play. 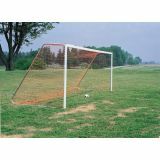 Goal support uprights are constructed of 2" x 4" 14 gauge steel tubing. 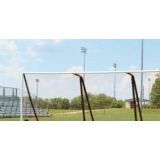 Top football uprights are 2" square steel tube, extending 10' above the crossbar. Finish is tough durable white powder coat over zinc rich primer. Includes “money clip" style net attachment. Permanent or semi-permanent installation, using optional ground sleeves. 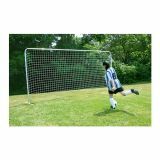 Nets (SEYL-24NHP with no top depth, 8' x 24' x 0' x 8') and backstays purchased separately. 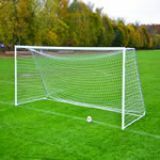 Uniquely designed goal provides outstanding performance and versatility. 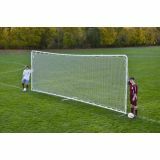 Perfect for competitive indoor play and an ideal outdoor training and youth goal! 7'H x 12'W x 4'D. 2" O.D. zinc undercoat with powder coated steel construction provides excellent durability. 1-5/16" O.D. zinc undercoated steel backstays fold without removing net. Non-marking floor protectors included for indoor use. Ground anchors for outdoor use available separately. Includes 4" sq. mesh net with hook and loop net straps to eliminate lacing. This light weight, stable goal is perfect for European style training. Large (8'H x 24'W). 2" O.D. Heavy wall aluminum frame with white powder coated finish. 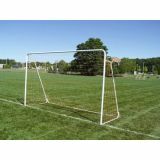 Also includes additional bottom crossbar with extra anchored base, white 1-1/2" sq. mesh net with 1/8" cord and bungee net attachments. Includes a carry bag. This light weight, stable goal is perfect for European style training. Medium (7-1/2'H x 18'W). 2" O.D. Heavy wall aluminum frame with white powder coated finish. 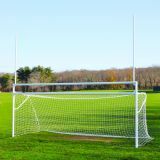 Also includes additional bottom crossbar with extra anchored base, white 1-1/2" sq. mesh net with 1/8" cord and bungee net attachments. Includes a carry bag. This light weight, stable goal is perfect for European style training. Medium (7-1/2'H x 18'W). 2" O.D. Heavy wall aluminum frame with white powder coated finish. 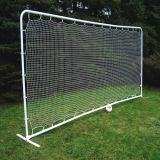 Includes 4" square mesh nylon net. Stabilizing ground base plate included. Includes a carry bag.